Faith and Theology: What is the opposite of faith? Let’s start with the Protestant no-no: works. We are justified, put right with God not by works but by faith, faith alone – sola fide – isn’t that, as Luther put it, the doctrine by which the church stands or falls? And wouldn’t Calvin and Wesley agree? Well, yes, but … Luther was citing Paul, but during the last half century – through a better understanding of the thought-world of first century Judaism – it’s now become pretty clear that what Paul meant by “works” and what Luther meant by “works” are not identical. 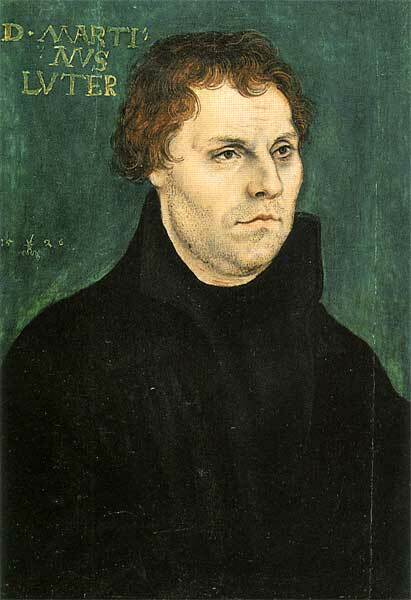 For Luther, troubled by the question “How can I find a gracious God?”, works were the pious efforts he made as a scrupulous monk to make himself acceptable to God. Driven to despair by the inevitable could-do-better inadequacy of these efforts, Luther finally discovered that God accepts the unacceptable, that grace is unmerited, unearnable, a free gift, received by faith alone. In short, for Luther, the doctrine of justification by faith addressed the nature of salvation; for Paul it addressed the nature of the church. Which is not to knock Luther. Mind, Luther’s re-interpretation of Paul’s law-free gospel was not only brilliant but, especially in his own decadent medieval context, true: no pious practice or moral activity can get us right with God. The problem is that Luther’s teaching has suffered from the abuse of thinking (a) that it is our faith that saves – it isn’t, it is Christ's faith that saves; and (b) that our faith is something that happens in our heads or our hearts, and not also in our hands. This is a horrendous misreading of faith. And it has led to the catastrophic idea that faith is a private matter, that it entails no public commitments; faith as a kind of personal fire insurance for the afterlife, while the world goes to hell in a handcart. Bonhoeffer derided such faith as “salvation egoism” relying on “cheap grace”. So, yes, a certain kind of “works” is the opposite of faith, the kind that we do to earn salvation, but faith itself is never works-less, rather faith issues in works as night follows day, with immense social and political implications. So we’ll have to look elsewhere for the opposite of faith. I know – how about doubt? But, no, I don’t think doubt will do either. There is, for sure, as with works, a kind of doubt which is entirely negative, which puts faith in jeopardy. But I suspect that the main kind of doubt with which we are familiar is the inquisitive kind, the kind that asks good and hard questions – and that won’t be fobbed off with shallow and unconvincing answers. This kind of doubt is essential to a robust faith. This kind of questioning is actually sacred. A faith that doesn’t ask questions, including questions about itself, to keep itself honest, free from hypocrisy, cliché, and guff is an unworthy faith. And a faith that won’t engage in dialogue with other Christians, with people of other faiths, with people with no faith at all – this kind of faith is either pathetically insecure or it’s hiding something. And a church that doesn’t encourage such open, probing conversations will be a dumbed-down and finally ignorant church and not the culture of listening and learning it is called to be. Perhaps, then, we could say – a third possibility – that the opposite of faith is certainty? And if we understand certainty on the model of, say, mathematics, that is true. Faith is certainly (!) not certain like 2 + 2 = 4 is certain. Faith wouldn’t be faith with that kind of certainty. But there are other models of certainty on which we might draw. Friendship, for example. I think most of us would want to say that the faith – the trust – I have in my best friend, my soul-mate, is certain. And Jesus calls his disciples his friends (John 15:15). The certainty of faith is not mathematical, but neither is it a He-loves-me/He-loves-me-not sort of uncertainty. Here the martyrs are our mentors. Perhaps we should rephrase this kind of certainty as the assurance of faith – and what a blessed assurance it is! I suppose I must mention a fourth possibility, namely that the opposite of faith is reason, because the New Atheists continue to swagger that Christians are a bunch of morons, that faith is irrational, that it is belief without evidence. Which in one sense is true, because God is not a member of the world who offers himself for observation and inspection, nor is God one more big and powerful thing, even the biggest and most powerful thing, in the universe. But in another sense it is patently false that faith is evidence-less, for faith is dependent on witnesses to the life, death, and resurrection of Jesus of Nazareth, dependent on the reliability and truthfulness of the gospels. And as for the rationality of faith, when the great 20th-century theologian Karl Barth was asked how reason fits into his theology, he replied, “I use it.” So does any sensible Christian. In Through the Looking Glass, the Queen says to Alice, “sometimes I’ve believed as many as six impossible things before breakfast.” The Queen could not have been a Christian. Now: here is a fifth alternative for the opposite of faith. It’s one you don’t usually hear: fear. On this reading, faith is courage. My text: Mark 4:35ff. A storm suddenly bursts and overwhelms the boat in which Jesus and his disciples are crossing the Sea of Galilee. While Jesus naps, his friends panic. They shake Jesus – “Wake up! Don’t you care that we’re sinking?” Jesus yawns, stretches, and says to the wind and waves, “Pipe down! Be still! Can’t a man get any sleep around here?” Then he turns to the twelve: “What a bunch! Why are you such cowards? Don’t you have any faith at all?” Cowards – faith – the contrast between the two is explicit. God is with us. We are never alone. Jesus is not only risen, he reigns. He has conquered death, the ultimate fear. Nothing can separate us from his love. That is why we need not, should not, cannot be afraid. So in these tumultuous times, take courage, and keep the faith!